Aubrey Drake Graham, popularly known as Drake or Drizzy Drake is a Canadian Recording Artist, Rapper, Actor and Song-Writer. Here I have compiled down some of the best drake quotes on love, life, friendship, girls from his public quotes and songs. 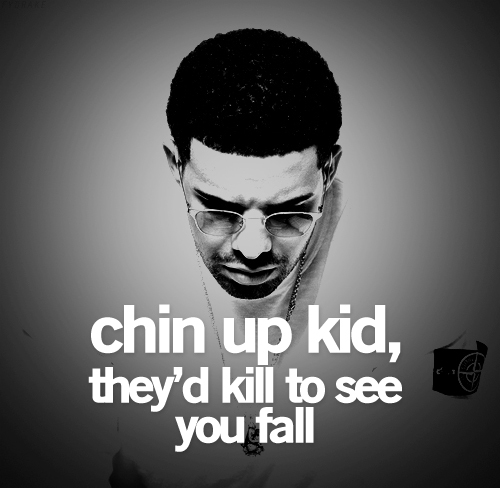 Hope you will like this quote compilation and share your favorite drake quotes with your friends. I didn't change, I grew up. You should try it sometime. We are more interested in make others believe we are happy than trying to be happy ourselves. I can see it in your eyes: you’re angry. Regret got sh-t on what you’re feeling now. Mad cause he ain’t like me. Oh you mad cause nobody ever did it like me. All the care I would take, all the love that we made. Now you’re trying to find somebody to replace what I gave to you. Beauty isn't about having pretty face it's about pretty mind, a pretty heart and pretty soul. Can’t deny that I want you, but I’ll lie if I have to. Cause you don’t say you love me to your friends when they ask you. Even though we both know that you do. You do. We live in a generation of not being in love, and not being together. But we sure make it feel like we're together, because we're scared of seeing each other with somebody else. I’m obsessed with perfection. I want to work. I don’t want to take this for granted. Don't leave somthing good to find something better. Once you realize you had the best, the best has found better. I’m just sayin’ you could do better and I’ll start hatin’ only if you make me. But get it while you here boy, ’cause all that hype don’t feel the same next year boy. Apologize if I say anything I don’t mean. Like whats up with your best friend? We could all have some fun, believe me. I’m lucky that you picked up, lucky that you stayed on. I need someone to put this weight on. I don’t think I’m conscious of making monster outta the women that I sponsor til it all goes bad. I’m just sayin’ you could do better. Tell me have you heard that lately? You tryna come up, I am the come up. I be standin’ right here when the sun up. Hope you don’t judge me. Cause me and you are not all that different. You made me this way, you made me famous. You all assisted. I know you left me once, but I came right back to find you. Even though I like being in your past, you got a bright future behind you. Sometime you have to stop worrying, wondering, and doubting. Have faith that things will work out, maybe not how you planned, but just how it's meant to be.